The most basic form of communication in the Hangouts app on your Samsung Galaxy tablet — and one of the oldest forms of communications on the Internet — is text chatting, in which people type text back and forth at each other. It can be most tedious. Touch a contact in the Contacts list. If you want to chat with several friends, keep selecting them. Selected friends have a check mark next to their account name or image. To deselect a contact, touch the contact’s account icon again. Choose Message from the bottom of the screen. Touch the Send icon to send your comment. The Send icon replaces the Photo icon when you type a message. You type, your friend types, and so on until you grow tired or the tablet’s battery dies. 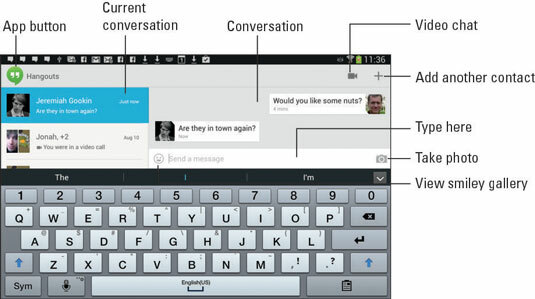 When you’re text chatting, or “hanging out,” with a group, everyone in the group receives the message. Resume any conversation by choosing that same contact from the Previous Conversations list. Adding more people to the hangout is always possible: During a chat, touch the Menu button, and choose the New Group Hangout command. Touch a friend (only available friends are listed) to invite him in. When someone sends you a text message by using the Hangouts app, you’ll see a notification. Select that notification to review the message and begin a conversation.